Incoloy®Alloy 020(UNS N08020) is an austenitic nickel-iron-chromium alloy with additions of copper and molybdenum. The nickel content makes Alloy 020 resistant to chloride-ion stress-corrosion cracking. Copper and molybdenum give resistance to reducing environments. The molybdenum content also provides good resistance to pitting and crevice corrosion. The chromium gives resistance to oxidizing environments such as nitric acid. The addition of niobium reduces the effect of carbide precipitation during welding, thus increasing the alloy’s resistance to intergranular corrosion. Alloy 020 has exceptional corrosion resistance in sulfuric acid environments, and is used in a range of applications involving this acid. Other uses include the production of gasoline, solvents, explosives, inorganic and organic chemicals, pharmaceuticals, food and synthetic materials. For these and other applications, Alloy 020 is readily fabricated to produce mixing tanks, heat exchangers, process piping, pickling equipment, pumps, valves, fasteners and fittings. Hot forming should be in the range 1400-2150°F (760- 1175°C). Incoloy® alloy 020 is normally used in the annealed condition. Annealing: 1800-1850°F (982- 1010°C)/ for a time commensurate with section size/AC. 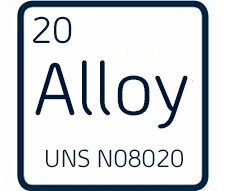 Incoloy® alloy 020 is designated as UNS N08020. Standard product forms include pipe, tube, sheet, strip, plate, round bar, flat bar, forging stock, hexagon and wire. Rod, Bar, Wire and Forging Stock.